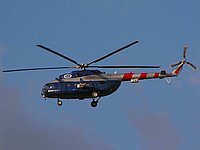 In 1996, Kazan Helicopters delivered an Mi-17 (construction number 226M205, Registration RA-70877) to Kelowna Flightcraft of Canada in order for a glass cockpit to be installed. It was planned to certificate the Mi-17KF according to the FAA Standard Airworthiness Certification Regulations Part 29 and to manufacture modification kits for installation in new-build and existing aircraft. First flight took place on 3 August 1997 and was followed by prototype test flights. The Mi-17KF was unveiled at Air Show Canada 1997 which took place at Abbotsford in August 1997. Programme consists of the Honeywell-designed EDZ 756 Flight Deck including the following equipment: FZ-706 Flight Director System, Electronic Flight Instrument System (EFIS), AA-300 Radio Altimeter, Primus 700 Weather Radar, Primus II Nav/Comm/Audio System, AV-850 Audio Panel, UNS-1L Flight Management System (FMS) with the Attitude/Heading Reference System (AHRS) and the KHF 950 HF/SSB Radio. Optional equipment which can be added by customer request include floatation system providing 30 minutes of buoyancy, external cargo sling with 11,000 lbs capacity, external winch at left hand entry door with 650 lbs capacity, auxiliary fuel tanks increasing range to 670 nautical miles, Night Vision Goggle compatible cockpit, Doppler Navigation System and Global Positioning System. There had been speculation that Kelowna Flightcraft would offer the Mi-17KF within the Canadian Search and Rescue Helicopter Project announced on 8 November 1995; however, this bid was not made, chiefly because the Mi-17KF certification was not realized. In 1999 the prototype was reportedly converted into another Mi-17 demonstrator. 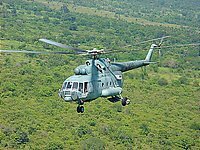 The Sri Lanka Air Force (SLAF) Mi-171 use the Flight Guard Self Protection System as their primary anti missile system. A formation of SLAF helicopters was fired upon by five Surface-to-Air missiles. The three Mi-17s in the formation were fitted with ELTA's system, and escaped unscathed (saving 90 troops and 12 crew) but the escorting Mi-24 had not been fitted with the system, and was downed - The Mi-24 used a manually operated anti-missile system. Incidently the missiles fired were all IGLA SA-14s. When the Tamil Tigers attacked the Naval base in Trincomalee Harbour, SLAF Mi-24s were dispatched to provide air cover. Above them, an SLAF Beechcraft hovered - all three helping to co-ordinate the ground operations. One of the Mi-24 helicopters which veered out was hit by a Tamil Tiger Surface-to-Air missile and plunged into the sea. The second helicopter too had come under missile fire but this aircraft which was using the ELTA system had activated the counter missile system in time and was able to avoid being hit. The missiles used in this incident were FIM-92A stingers. Peruvian company Desarrollos Industriales Casanave has armed Peruvian army aviation Mi-17-1Vs with its HMP-250A1DC kit, allowing the Russian-built helicopters to operate also the NATO-standard gun pod. Necessary work was done only at the gun pod. To avoid problems with the Russian manufacturer, nothing was changed at the aircraft. The system, called Huracán-I was developed in December 2010 due to an emergency request of the Peruvian army for counter-insurgency operations. The HMP-250 gun pods were originally acquired to arm the A109K Hirundo helicopters delivered in 1991 to Peru. The Heavy Machine Gun Pod (HMP) was developed by Fabrique Nationale Herstal (FN Herstal) of Belgium. The HMP-250 was designed to carry one FN M3P Browning 12.7 mm machine gun. The M3P has a rate of fire of 1.000 rounds per minute and may use any type of 12.7 mm ammunition. The effective range is 2 km. Modernization programme realized in cooperation with WZL-1 and Przemysłowe Centrum Optyki S.A.